Our firm ensures to comprehend and meet the diverse requirements of customers, by offering a superior range of Torry Meter Fish Freshness Meter. Fabricated using the finest grade raw material and sophisticated technology, this product is designed in compliance with the international quality standards. This product is essential for the accurate measurements of oxygen levels for various applications in water treatment plants, sewage treatment works, effluent activated sludge process, river monitoring and fish farming. We are the suppliers Torry Meter Fish Freshness meter, Fish Fat meter, Meat Fat meter for instant results. Pre-calibrated for different species. Userful for researchers, exporters, retailers of fish and meat. Meter Enclosure Made from ABS plastic, waterproofed to IP65 (BS 5490, 1977). Mains Supply Connections 3-pin plug or other suitable terminals for country of use. We supply Fish Freshness Meter (Torry Meter) which is made of fine quality and durable raw material. 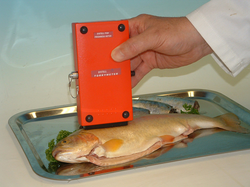 This high performing Torry Meter is helpful in determining quality and freshness of fish. These are hand held instruments and very easy to operate. This instrument measure conductance, capacitance and Q-factor of the flesh and muscle structure to measure the freshness of fish. It is reasonably priced and suits to all kinds of customers’ budget and affordability. We are the suppliers Torry Meter Fish Freshness meter, Fish Fat meter, Meat Fat meter for instant results. Pre-calibrated for different species. Useful for researchers, exporters, retailers of fish and meat.